Lori Siebert has always been a bit of chameleon when it comes to her artistic style. When she was young, she’d make candles out of crayons, flowers out of tissues, and cakes from a mixture of mud, leaves, and plants. Though she ditched the mud pies long ago, she still draws inspiration from many sources including her children’s drawings and off-beat pieces of folk-art. Today, she truly is a master of many mediums. “I can't remember a time when I wasn't creating stuff,” she says on her blog. CheckAdvantage is proud to present select works from Lori Siebert on our checks, address labels, and checkbook covers as part of our Licensed Artist Series. Lori was shy and excelled at creativity when she was growing up. She started getting serious about art when she was six and won a local competition with her painting of “JoJo” the clown. 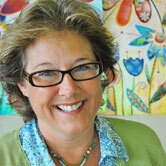 At age seven, Lori began private lessons and pursued art throughout high school. Her hard work paid off and she got a degree in Graphic Design from the University of Cincinnati, one of the top ten design schools in the nation. Just three years after she graduated, Lori started her own design firm in 1987. The client list would eventually include names like Nickelodeon, Universal Studios, and Bath & Body Works. Today, she sells her art on products for several different markets. This includes realms such as gift, home décor, tabletop, fabric, baby, and garden. When it comes to her sources of inspiration, it’s as diverse as her products. She loves looking to antiques, flea markets, and Pinterest for ideas, but also draws from artists like Paul Klee, Matisse, Modigliani, and Picasso. Lori is also inspired by community. Not only does she love sharing her products with friends and family, she enjoys getting to know other artists and sharing in the lives of like-minded creative people. In fact, she’ll be doing just that when she hosts her first workshop this September at ArtBizJam in Florida. At this conference, she will teach about the design and business sides of art. To see more of Lori’s work, you can visit the website of her design studio, www.studiolika.com/. You can also follow her blog lorisiebertstudio.blogspot.com and check out her Pinterest page.